We’ve worked long and hard, and we can’t wait for you to hear it! “LOVELY,” the debut album by comedian Drew Michael will be available world wide on WEDNESDAY, AUGUST 14TH! Mark your calendars! The last two albums from The Red Bar Comedy Record Label went to #1 on iTunes thanks to you guys – lets make that happen again! We’re also throwing RECORD RELEASE PARTIES on FRIDAY AUG 16TH & SATURDAY AUG 17TH. 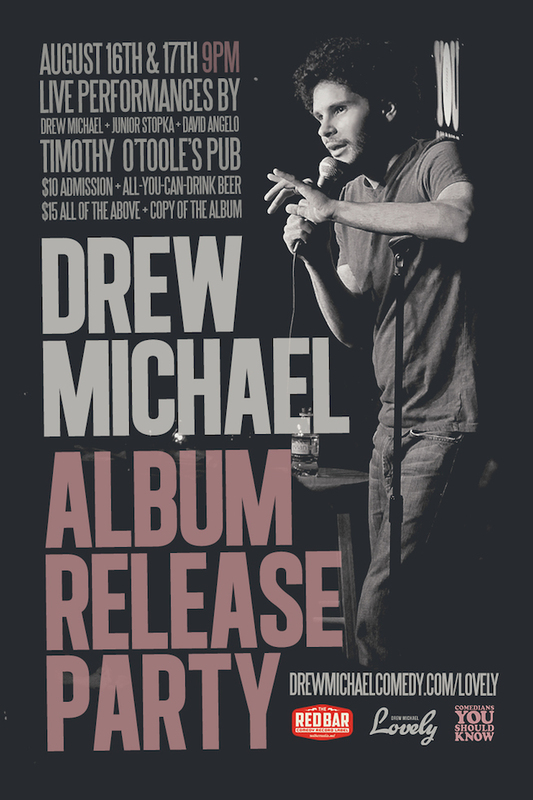 Admission includes all-you-can-drink beer and a signed physical copy of the album. OH, and guess who’s performing? Drew Michael, Junior Stopka, and our old best friend, DAVID ANGELO! Jesus!